During the dark days of the Blitz, John Gillespie Magee, Jr., was one of the many Americans who enlisted in the Royal Canadian Air Force. Within a year, he was sent to England and assigned to the No. 412 Fighter Squadron, RCAF, where he flew the Supermarine Spitfire. On September 3, 1941, he flew a high-altitude test flight in a new model of the Spitfire V. As he climbed upward through 33,000 feet, he experienced great exhilaration which inspired his immortal line, “to touch the face of God.” He later expanded it into a poem. Three months later, he was killed in a midair collision. He was only 19 years old. Although young John Magee was lost, he had sent a copy of his poem to his father, who was then rector of a Washington, DC, church. His father printed it in church publications. This led to its inclusion in an exhibition of poems called Faith and Freedom at the Library of Congress in February 1942. High Flight has since become the most famous aviation poem ever written. It has inspired countless aviators and astronauts. It is the subject of a special exhibit at the National Museum of the United States Air Force in Dayton, Ohio. U.S. Air Force Academy cadets are required to memorize it. 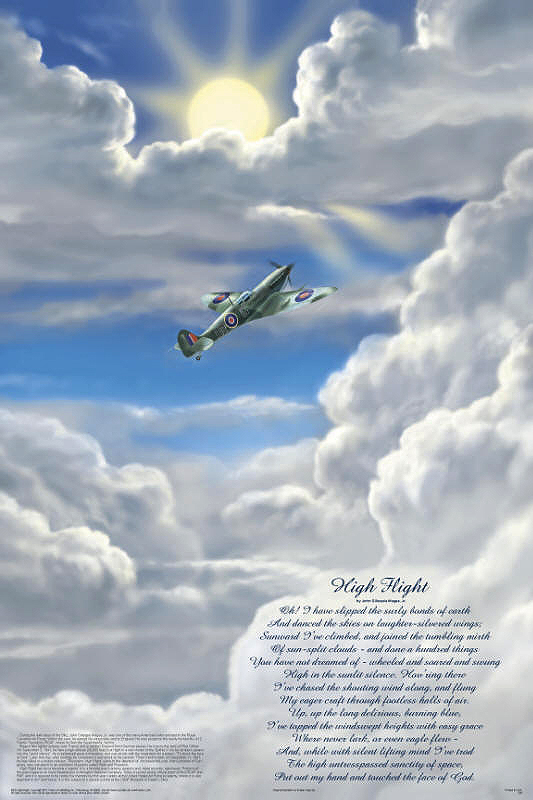 The poster magnificently depicts his Spitfire climbing toward the peak of its exciting flight and cites the full text of his ageless and classic poem. A caption, located in the lower left corner, tells the story behind it.